This course is intended for people seeking to improve or review business grammar skills at an intermediate level. Participants are expected to be experienced in basic English grammar skills, including sentence and paragraph development, spelling, and punctuation. The primary goal of this course is to enhance the professional impact of business communications by improving and updating participants' grammar, punctuation, and word usage skills. Correct use of words frequently confused such as affect/effect; further/farther, etc. 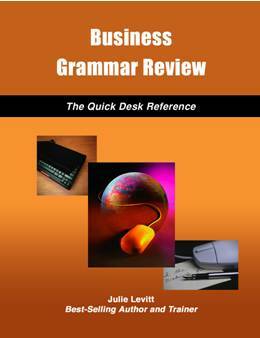 Business Grammar Review, by Julie Levitt, is a 100-page book provided for each course participant. This comprehensive collection of easy tools to improve English grammar usage serves as both a learning tool and a user-friendly reference for future use. The book reflects current business trends and standards.